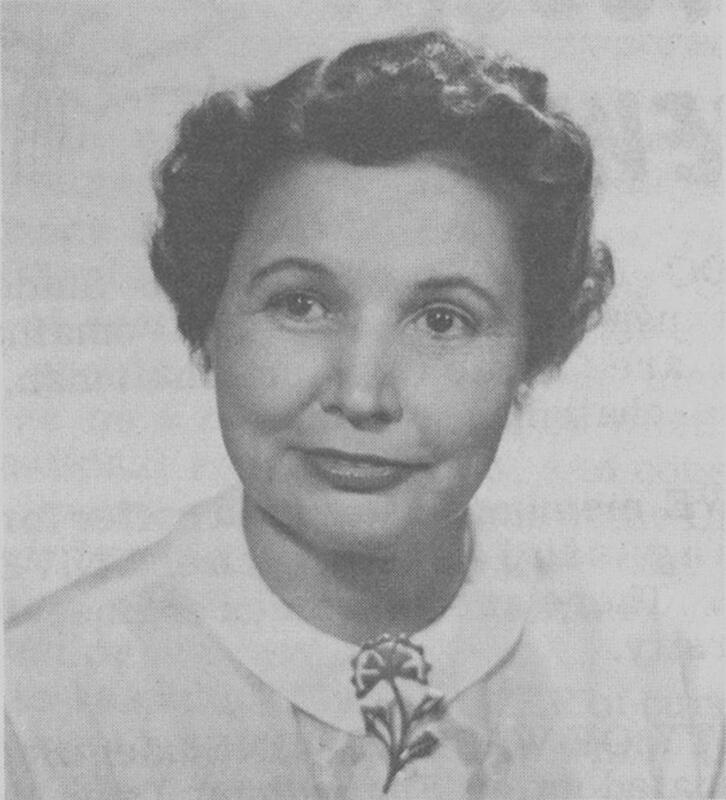 From the Skunk Works to the stars: that was the trajectory of the remarkable and still partly secret career of Mary Golda Ross (Cherokee), the first Native aerospace engineer who was a member of the top-secret team planning the early years of space exploration. She is now being honored on a special $1 U.S. coin. Born in 1908, Mary Golda Ross grew up in Park Hill, Okla. Her great-great grandfather was Cherokee Chief John Ross, who led the Cherokee Nation during the traumatic and turbulent Indian Removal era of the 1830s that resulted in the forced relocation of thousands of Cherokee people to west of the Mississippi River in present-day Oklahoma. Ross attributed her successes to the rich heritage of her Cherokee people and the importance of tribal emphasis on education. “I was brought up in the Cherokee tradition of equal education for boys and girls,” she said. 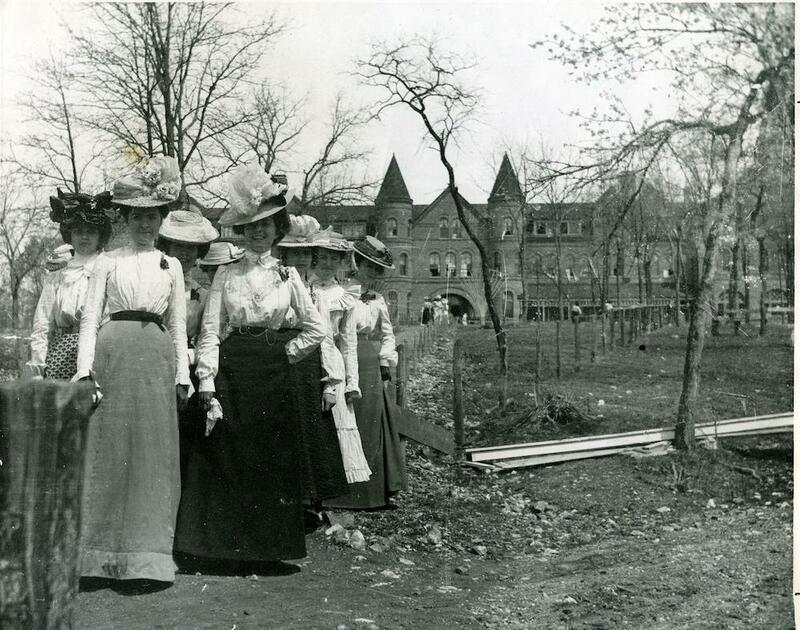 “It did not bother me to be the only girl in the math class.” Her home town was the original site of the famed Cherokee Female Seminary, the first women’s institution of higher education west of the Mississippi. Its cornerstone was placed by Chief Ross in 1847, and it opened in 1851. The curriculum emphasized science, with courses in botany, chemistry and physics. It’s a tribute to both Ross’s ability and the quality of her eduction that she was able to launch successfully into the next stage of her career. Pursuing a passion for astronomy, she took a master’s degree at the Colorado State College of Education (now Northern Colorado University). After earning her degree, Ross joined Lockheed Aircraft Corporation in 1942, helping design the P-38 fighter airplane. Six years later, she was an integral part of what was later called the “space race.” As one of 40 engineers in Lockheed’s Advanced Development Programs, what became known as the Skunk Works, the company’s top-secret think tank, she was the only woman on the team aside from the secretary. She was also the only American Indian. Much of her research and writing at the Skunk Works remains classified, even today. “It is closed even to me,” laughs Willis Jenkins, an engineer in NASA’s Heliophysics Division, “even though I am an official at NASA.” Jenkins was assigned to research Ross’s career, as liaison to the U.S. Mint’s commemorative coin project. Jenkins notes, “I sought to place myself in her shoes by performing calculations to see how I would get a rocket in space. I marveled at the work that had been done to get a rocket outside the Earth’s atmosphere, which is a magnificent accomplishment. Over the years, Ross helped write NASA’s Planetary Flight Handbook, the agency’s comprehensive guide to space travel. She worked on preliminary concepts for flights to Mars and Venus, laying the groundwork for missions that have not yet come to fruition. The equation, which is seen in the clouds on the design, was used to help determine the velocity needed to leave the Earth and travel to a distant planet such as Mars. Jenkins identified the equation as “an example of a formula that Ms. Ross would have used to calculate interplanetary space travel, determine the departure plane orbit and transfer orbit energy. 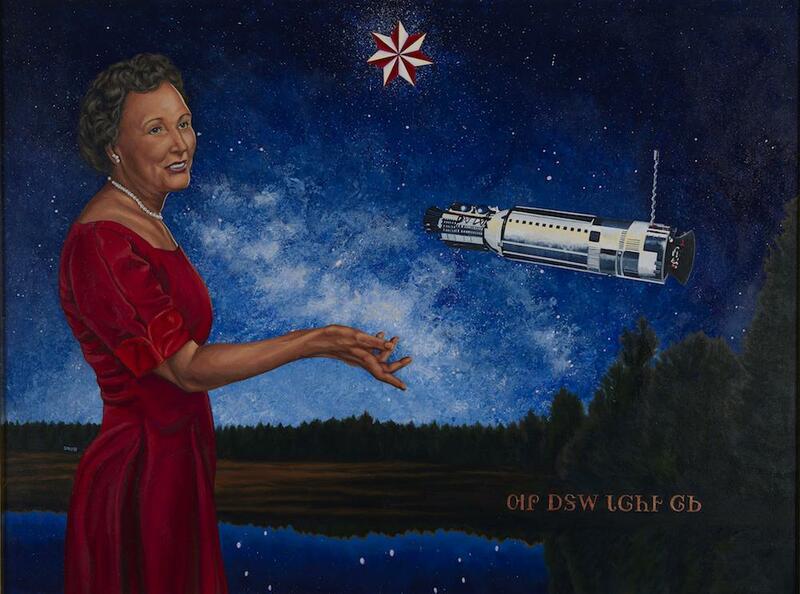 The earth-bound achievements of Mary Ross will be the centerpiece in early 2019 of a new coin honoring American Indians in the Space Program. Each year since 2009, the United States Mint has produced and issued a $1 coin that celebrates significant contributions Indian tribes and persons have made to the history and development of the United States. Ross will represent both her own work and that of several other prominent Indians, such as astronaut John Herrington (Chickasaw) and flight controller Jerry C. Elliott High Eagle (Osage/Cherokee). 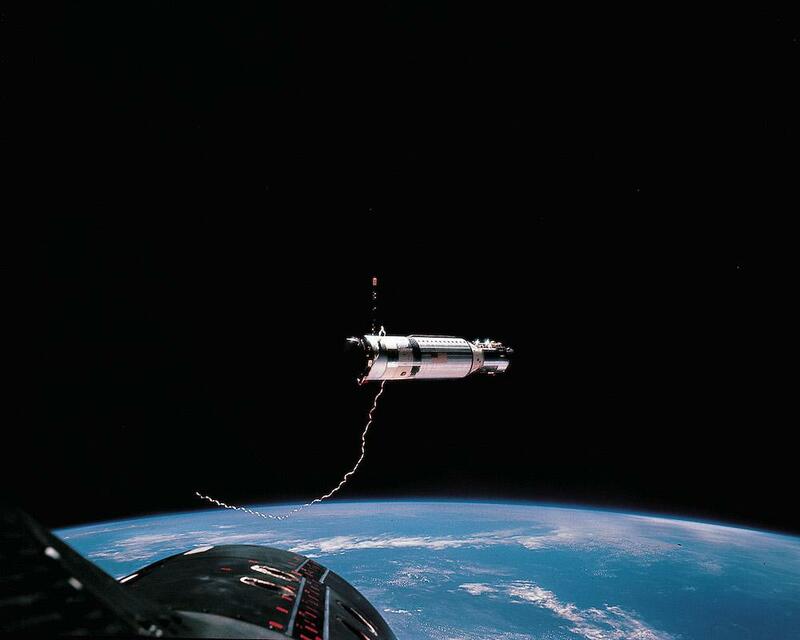 Herrington manned the International Space Station in 2002. Elliott plotted the re-entry of the troubled Apollo 13 mission and received a Prsidential Medal of Freedom for his role in saving the astronauts. The Ross proposal, like many of the Native American $1 coins, started as a narrative provided by and design concepts developed in consultation with the National Museum of the American Indian. The Native American $1 Coin Act requires consultation with the Committee on Indian Affairs of the Senate, the Congressional Native American Caucus of the House of Representatives, and the National Congress of American Indians. Once the design concepts are defined, the Citizens Coinage Advisory Committee (CCAC) discusses them during its public meetings. Emily Damstra, an American freelance science illustrator living in Guelph, Ont., was selected to create the design for the 2019 coin. 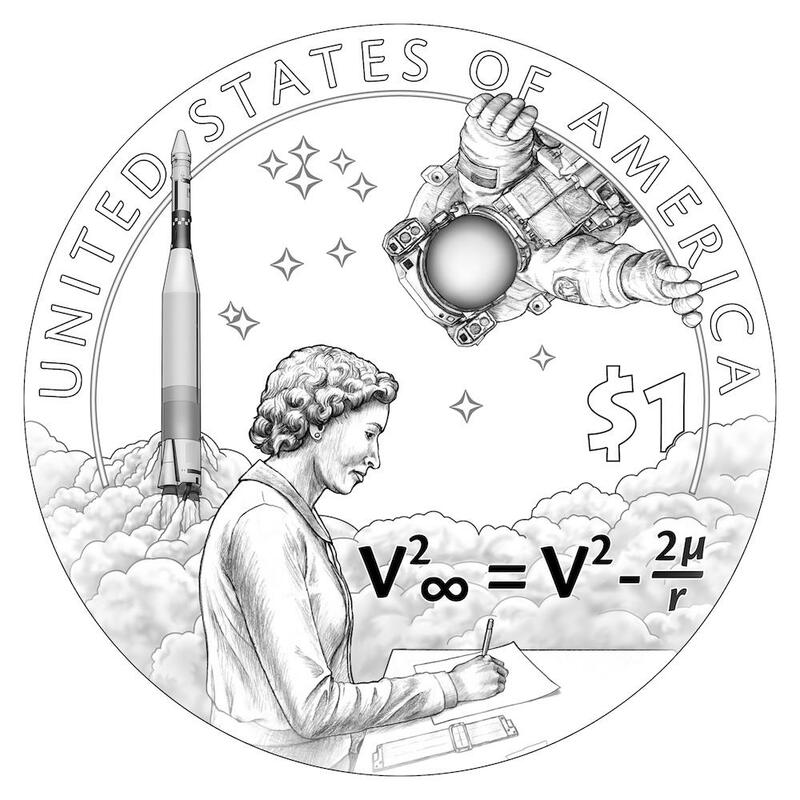 She explains, “I first learned about Mary Golda Ross upon receiving the assignment to design this coin celebrating the contributions of American Indians to the United States space program. Her achievements deeply impressed me, and I was excited for the opportunity to tell her story through numismatic art. From the beginning of my design process, before I had anything else worked out, I knew that my design would include a figure of her.” Damstra’s only regret is that she could not fit in a feather into her design. A figure representing American Indian astronauts is included, she says, because, “I knew Ross was not the only American Indian who contributed to the space program. Though we don’t see his face, the astronaut in my design is outfitted as John Herrington would have been for extravehicular activity. I liked the idea of including an astronaut in space because such a feat was ultimately made possible by the work of people like Mary Golda Ross. Although humble, Ross herself likely realized the important legacy of her work. After retiring from Lockheed at age 65, she pursued her interests in engineering by delivering lectures to high school and college groups to encourage young women and Native American youth to train for technical careers. In 2004, at age 96, she attended the opening of the National Museum of the American Indian building on the National Mall in Washington, D.C. Wearing a traditional green calico Cherokee dress she had asked a niece to make especially for the occasion, she marched in the opening procession of 25,000 Native people. Said a friend, “She felt she was a part of history being made, again.” She herself said, “The Museum will tell the true story of the Indian, not just the story of the past, but an ongoing story.” Ross died four years later, a few months before her 100th birthday. She lived long enough to see her work help launch an American Indian astronaut into orbit. Dr. Herman Viola serves as senior advisor for the Museum’s National Native American Veterans Memorial Project, is curator emeritus at the Smithsonian’s National Museum of Natural History and is a member of the Citizens Coinage Advisory Committee.